Adam Lyth celebrates his century for 'Yorkshire Vikings against Northamptonshire Steelbacks at Scarborough (Picture: Bruce Rollinson). THE greatest innings in Yorkshire’s one-day history was played on this ground in 2001 by Darren Lehmann, who scored 191 against Nottinghamshire from 103 balls with 20 fours and 11 sixes. The greatest compliment that one could pay to Adam Lyth yesterday was that his innings of 125 against Northants from 78 balls with 10 fours and eight sixes evoked memories of Lehmann’s famous performance, made after the legendary Australian had sipped remnants of champagne from his batting helmet moments before walking to the crease two days after Yorkshire had won the County Championship. 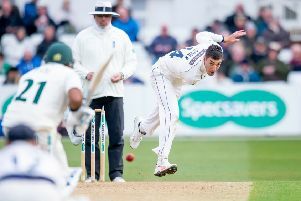 Lyth, the 28-year-old left-hander, reached his hundred from 60 balls – seven balls quicker than Lehmann on that storied day – as Yorkshire won by two wickets with 15 balls to spare after Northants had made 310-7, Ben Duckett contributing 121 to the eighth-highest total Yorkshire have conceded in one-day cricket. It is not known whether Lyth had a swig of champagne before walking to the crease, but he certainly deserved a glass or several of it after the match, regardless of the fact that Yorkshire are back in Royal London Cup action today against Lancashire at Old Trafford (2pm start) as they look to build on their first limited-overs win of the season. Beneath cloudy skies, Yorkshire began encouragingly here after Alex Lees won the toss. In his first appearance against his former club, David Willey trapped Adam Rossington lbw in the fourth over, and Liam Plunkett had Josh Cobb brilliantly caught one-handed by Kane Williamson at mid-wicket diving to his left in the ninth over. But Duckett and Alex Wakely rebuilt with a mixture of skill and resilience, along with the odd bit of fortune as aerial strokes landed just wide of fielders. Wakely was dropped on three by Plunkett in his follow-through, a difficult chance low to his right, and on 38 by Gary Ballance at deep square-leg off Tim Bresnan, a relatively simple opportunity by that fielder’s high standards. Wakely went on to a 60-ball half-century – one ball quicker than Duckett had reached the milestone – as they filled their boots on a decent pitch. Duckett, 21, is one of the coming men of English cricket; he started the season with Championship scores of 282 against Sussex and 189 against Essex, and last week he made a one-day career-best 98 against Lancashire. Yesterday he showed a full range of strokes, blending the deft and dynamic in an exhibition appreciated by the 1,630 crowd. Duckett and Wakely added 166 in 27 overs – a Northants third-wicket record against Yorkshire – before Wakely danced down the track to Lyth, got stuck in two minds, and tamely patted back a return catch. Wakely’s departure for 71 from 79 balls was swiftly followed by that of Rob Keogh, whom Plunkett had caught at slip by Bresnan. Plunkett was in grand form in front of national selector James Whitaker, who would also have been impressed by Willey ahead of the one-day series against Sri Lanka. It was a less successful day for Adil Rashid, the third member of Yorkshire’s ODI contingent on show, who conceded 67 from eight overs but who did claim the wicket of Duckett, coolly taken by Jack Leaning running in from deep mid-wicket after a 113-ball innings that included 15 fours and two sixes. Steven Crook hit 46 not out from 41 balls at the end to ensure that Duckett and Wakely’s platform did not go to waste. As if by royal appointment, the sun came out for Yorkshire’s reply and Lyth’s batting was no less radiant. A flurry of boundaries saw him race to a 32-ball half-century, which he reached with the first of three sixes in an over off Ben Sanderson, the former Yorkshire pace bowler. Lyth and Lees added 106 for the first-wicket before the captain spooned one up into the leg-side, while Williamson chipped on. Lyth ploughed on until eventually holing out to Richard Gleeson running in from deep mid-on, who collected a skier off spinner Graeme White. It was the first of three wickets in nine balls as Leaning was caught and bowled and Rashid taken at mid-on as Yorkshire fell to 192-5. But Ballance and Bresnan showed all their class and experience to add 58 in 13 overs, Bresnan eventually holing out to deep extra-cover. Ballance reached a half-century from 62 balls and went on to 80 before being bowled by Azharullah with eight runs needed. Two balls later, Azharullah bowled Plunkett as Yorkshire fell to 303-8, but Willey sealed victory with a pulled six off Crook.